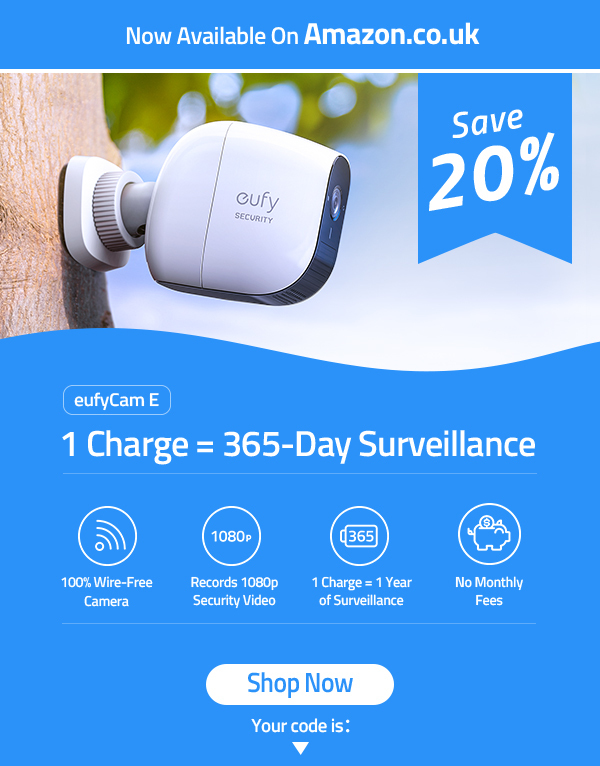 eufy Security has launched their second wireless security camera dedicated to providing home surveillance—eufyCam E.
Built with a wire-free connection, the low-profile IP65-rated case is designed to help you keep watch of your home both indoors and out. Save 15% on eufyCam E! Click on the link to save 15% on your eufyCam E home surveillance system! Don’t forget to use EUFYEMJY to claim your discount at checkout! Looks nice! Just a bit too much money for me though. sure is a bit pricey. For us Canadians it rings at $599.99 on Amazon.ca plus taxes for two cameras. Love to get this but if it was half the cost. It’s a fair chunk of money fella. Can’t put a price on security though. I’m not convinced the system is right for me. I think I’d like 24hr recording or at least I’d want it to record the 1-2 minutes before the camera picked up movement. Could continually record but then delete files through the day if there were no alerts or something. May be wired cameras are in the plans at Anker R&D that will do the job you need. I have been looking into home security set up...This is a pretty solid option to oppose the Arlo cams. I am very interested until I saw the price on Amazon Canada. Will have to wait till the technology can sell itself to me. Awesome deal and these cameras look great. I have to put purchasing a system. To many big purchases this year. Eufy Thanks for the 30% off coupon, it was finally emailed to me early morning today 2/21/19. Order has been placed. Only after I emailed Eufy Support... they issued an apology for not getting the code. I wonder if others received their codes. That is strange, I haven't got mine too, was not worried as I was not in rush. Sending email to support now. I currently have the original eufyCam setup from Kickstarter and I'm interested in these. However, these cameras are not capable of any facial recognition correct? Basically will just notify of motion events and have no sort of "smart ai" like the original cameras? If you connect this to the original homebase with AI, you will be able to use facial recognition and other smart AI features.